This time of year when you are considering lawn and garden fertilizers, pass up the “death row” of chemicals and head to the bags of compost. 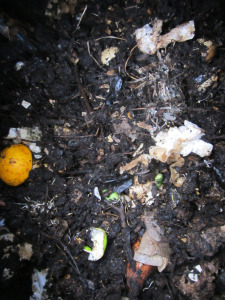 Compost in the breaking down process, food scraps turn into rich organic soil. It is that time again…time to compost your lawn. This is a fantastic way to add quality soil to your lawn, fertilize your sod and get in a good workout all at the same time. The purpose for adding compost is to add an organic fertilizer while adding depth to your soil. Adding depth to the soil allows the roots of your lawn to have some additional soil to grow into. Compost is filled with nutrients and micro organisms that feed fungus and micorrhizea (necessary for plants to use the soils nutrients for food) and it helps to repair the damage a harsh winter, drought or overuse of chemicals can leave behind. It also makes your soil more absorbent and able to hold moisture longer. ← Landscaper vs Lawnscaper…Know the Difference! If Your Front Yard Was Your Car, Would You Want To Be Seen In It? Yes, We Have No Banana’s! Cotoneaster, Say it 3 Times Fast! Summertime, Is Your Landscape Easy? Summertime is for Landscape Design! Compost Each Spring, The Planet Digs It! Do Your Plants Have Anger Issues?